We’ve spent plenty of time looking back, with this past Wednesday being the 20th anniversary of the Blue Line and the birth of Metro Rail. I wanted to look forward today and provide a quick update where future Metro Rail projects were in the pipeline. The list below is of projects that are set to receive Measure R funding and have the potential to be built as rail lines. In many cases, the projects are still being studied and rail is a serious candidate, but other options (such as bus improvements or not building anything) are also being studied, as is required by law. The ultimate decider on what-gets-built-and-where will be the Board of Directors of Metro. I’ve included the dates that the projects are slated to be complete under the long-range plan approved by the Board of Directors last year. Keep in mind, however, that if Congress approves the 30/10 Initiative, the plan is to finish the projects below in the next decade instead of the next three decades. One other note: This stuff is not going to be built in a vacuum. There are other notable projects also under construction or in the planning stages. Among those are an extension of the Orange Line busway to the Chatsworth Metrolink station and the Wilshire Boulevard peak-hour bus lanes in the city of L.A., to name just two. GOLD LINE FOOTHILL EXTENSION: Construction is expected to begin later this year on the 11.4-mile line that will extend the Gold Line from its current terminus in Pasadena to the Azusa/Glendora border. Officials with the Foothill Extension Construction Authority, the agency building the line, are targeting a 2014 opening. EXPO LINE, PHASE 2: The first phase is under construction between downtown Los Angeles and Culver City and may open in stages — with the downtown-to-Crenshaw segment debuting as early as 2011. Construction will soon begin on the second phase between Culver City and Santa Monica, which is scheduled to open in 2015. However, a lawsuit challenging the final environmental document for the line has been filed by some Westside residents. Whether construction will be impacted depends on how the courts ultimately rule. DOWNTOWN REGIONAL CONNECTOR: The line that would connect the Gold Line to the Blue Line and future Expo Line is in the draft environmental study phase. The big decision still to be made is whether the line travels at street level or underground, the alternative that seems to have the backing of many downtown residents and businesses. It is scheduled to be complete in 2019 and federal New Starts money is being sought to help pay for the line. WESTSIDE SUBWAY EXTENSION: The project would extend the Purple Line subway from its current terminus at Wilshire/Western to Westwood — either near Westwood Village or the VA Hospital. It is s also currently in its draft environmental study phase. 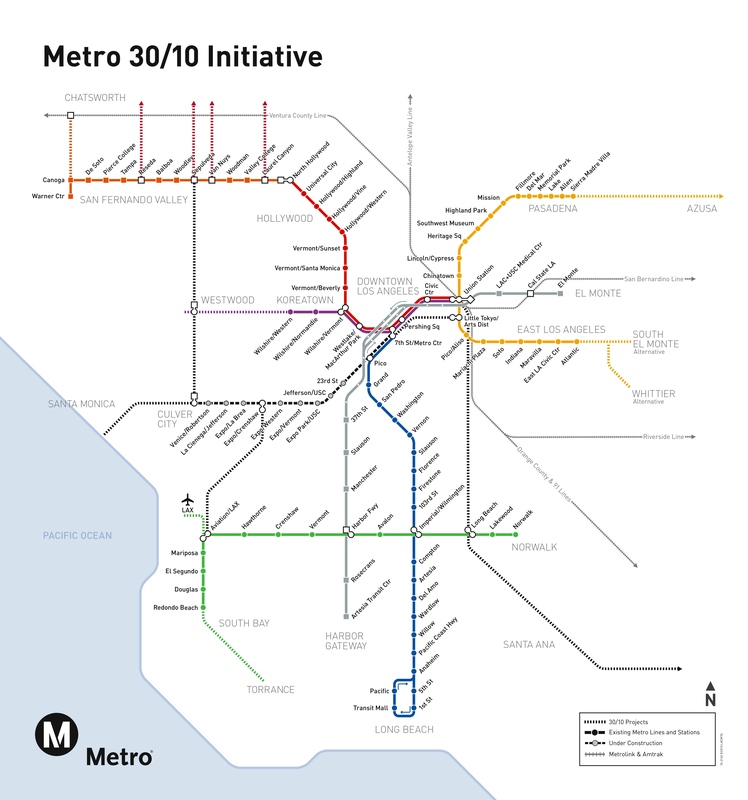 Federal New Starts funding is also being sought and the line would open to Fairfax in 2019, Century City in 2026 and Westwood by 2036 under the long-range plan, a timeline the 30/10 plan would considerably advance. CRENSHAW LINE: The light rail line will extend from the intersection of Exposition and Crenshaw Boulevards — where riders can transfer to the Expo Line — to a junction with the Green Line in El Segundo. The line is in its final environmental study phase and would add a station close to LAX at Aviation and Century boulevards. Scheduled completion date is 2018. WEST SANTA ANA CORRIDOR PROJECT: The project would use a 20-mile rail right-of-way puchased by Metro and which runs between Paramount and Santa Ana. No studies to define the project have yet begun. Completion date is 2027. GREEN LINE LAX CONNECTION: The project envisions some type of connection between the Crenshaw and Green lines and LAX, but no official studies have yet been launched. The connection may come in the form of a people mover that LAX has talked about building as part of a modernization of the airport. Some public officials have pushed for light rail to actually come into the terminal area, as it does in other airports. Completion is scheduled for 2028. SOUTH BAY GREEN LINE EXTENSION: The project is in the draft environmental study phase and is considering extending the Green Line from Redondo Beach to the Torrance Regional Transit Center along an existing rail right-of-way owned by Metro. The completion date is scheduled for 2035. EASTSIDE TRANSIT CORRIDOR: The project is in the draft environmental study phase and one of the major alternatives is extending the Gold Line from East Los Angeles either to South El Monte via the 60 freeway corridor or to Whittier, mostly along Washington Boulevard. The completion date is scheduled for 2035. SEPULVEDA PASS TRANSIT PROJECT: The project envisions transit improvements over the Sepulveda Pass between the Westside and the San Fernando Valley. Metro has not yet begun the studies that would further define the project. Completion date is 2039.